How to Grill Pizza Quickly and Easily | How Was Your Day? Instructions on how to grill pizza & samples were provided by Jack’s Pizza. Confession time: I am not a fan of pizza. I think it happened when I was working somewhere where we ate pizza like 3 or 4 times a week. Eventually, I just became like “NO MAS!” and I tapped out. That’s not to say I don’t ever eat pizza. It’s just not a common occurrence. And to get me to eat pizza, it usually has to be a really, really good pizza. Enter grilled pizza. I have to admit, I had never even considered grilling my own pizza. I suppose it makes sense, as I do enjoy woodfired oven pizzas. Even after seeing it on all sorts of cooking shows, the thought had still never occurred to me. I certainly never planned to grill a frozen pizza. However, after reading these simple instructions for how to grill a pizza, there was no reason not to give it a go. I figured a day by the lake on the 4th of July was the perfect time! It was tasty and surprisingly delicious. It didn’t seem to take too long, either. Although I wasn’t the one doing the grilling. We all know how that goes, right ladies? This grilled pizza serves 3-4, or it would make a fabulous appetizer. Tell me – will you be trying out grilled pizza at home? 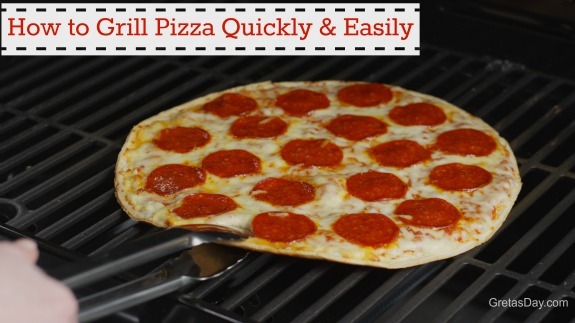 Grill a pizza, quickly and easily. Give your frozen pizzas a whole new twist. Frozen Pizza, such as Jack's brand pizza. You can check internal temperature with a standard cooking thermometer.